P.F. Chang’s China Bistro is committed to creating exceptional dining experiences in a relaxed, vibrant atmosphere. Each location boasts a unique combination of Asian and American influences, contemporary design elements and lighting, natural materials, and muted color palette. The P.F. 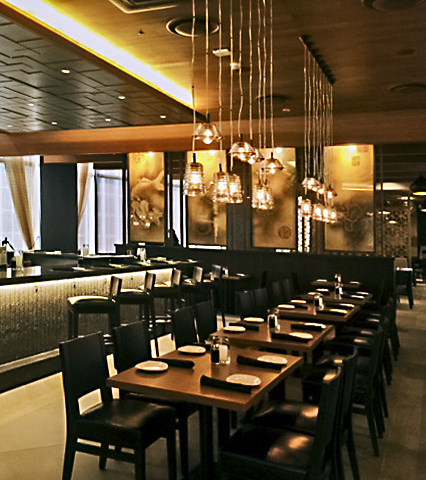 Chang’s that recently opened in Seoul, South Korea is a good example of the adaptability of the concept. It is notable because it is Aria Group’s first Korean project as well as P.F. Chang’s first location in South Korea. Aria Group was given the opportunity to work with a new client, ELX Food and Beverage, a franchisee of the P.F. Chang’s concept. We were recommended by P.F. Chang’s to help make sure the local client had all the resources they needed to create a location that is true to the P.F. Chang’s brand, yet is well adapted to the Seoul market. The P.F. Chang’s brand is evident from the trademark horse statue at the entry, to the hand-painted mural panels in the interior. The concept that drove the design of this location is based on the feeling of serenity that is sensed in temples throughout Asia. To inspire this mood, Aria Group designed the space with materials such as wood, iron, textural fabrics, and a nature-inspired color palette. The floor plan is open, flowing from one space into the next, while sliding wood screens give flexibility to separate the space and still allow filtered views throughout the restaurant. One challenge the team faced was to ensure that the design conveyed enough American influences, in order to stand out from traditional Korean spaces. The restaurant is located on the sixth floor of a high-rise building. Thus, there was a strict fire safety code that had to be adhered to, which posed another challenge to the design team. The end result, however, retains the full aesthetic character of the P.F. Chang’s brand. Aria Group has been working with P.F. Chang’s since 1998 creating a “collection” of restaurants for their upscale-casual Asian concept. Though some iconic design elements remain, their design style as well as their menu has evolved over the years in response to changing U.S. tastes, as well as a variety of International cultures as they have expanded their operations worldwide.